Australia's Hybrid Nightmares have returned with a new recording that continues their progressive mixture of black and extreme metal and this is a review of their self released 2015 ep "The Third Age". Wind sounds start off the ep before going into more of a heavy musical direction along with some high pitched screams and melodic guitar leads that are also a very huge part of t he recording and also mix in elements of technical death metal and some of the riffs also bring in a touch of thrash metal. All of the musical instruments on the recording have a very powerful sound to them and clean playing can also be heard in certain sections of the recording and they also give the songs more of a progressive feeling while some of the riffs also bring in a decent amount of melody and all of the tracks stick mostly to a slow or mid paced musical direction while the music does speed up briefly and also adds in a small amount of semi blast beats and the last track also brings in more of a raw black metal style along with a brief use of spoken word parts and acoustic guitars. 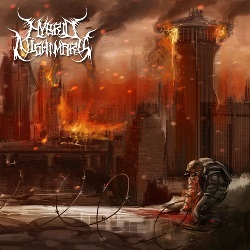 Hybrid Nightmares continues the mixture of progressive and extreme metal from previous recordings and also keeps the black metal vocals of previous recordings while also adding new elements to their musical style, the production sounds very professional for being a self released recording while the lyrics cover stories, absurdism, war and battle. In my opinion this is another great sounding recording from Hybrid Nightmares and if you are a fan of progressive black metal, you should check out this ep. RECOMMENDED TRACKS INCLUDE "The Purge" and "The Obelisk". 8 out of 10.